This little park, with it's hiking trails, I had previously visited, but did not get around to putting it on this website. Upon visiting again this year, I am glad I waited! Previously of the total 50 acres, located between the commuter train tracks and Beechwood and Norman Todd Lane, there seemed to be two portions to this park. 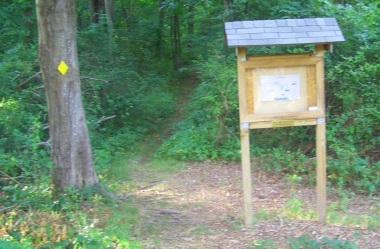 One side with a hiking trail loop created by two trails, Hillman and Benson Trails connecting. The other side with the Mack Trail leading to a very pleasant woodland overlook. Looking at the hiking trail map, one can see two separate hiking trails with a portion of land between the two trails. More recently these two separate trail portions have been linked by a third connecting trail giving those visiting the park the ability to visit the "whole" park. Long ago this land was farmland. 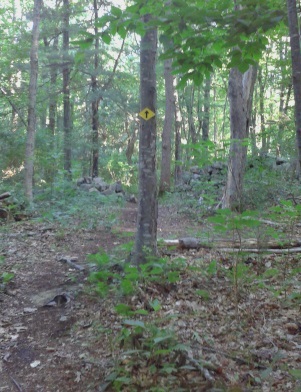 Now reforested, the Cohasset Conservation Trust purchased a little over 21 acres in 2007 from Osborne Ingram. Later in 2014 bought an additional 6 acres. 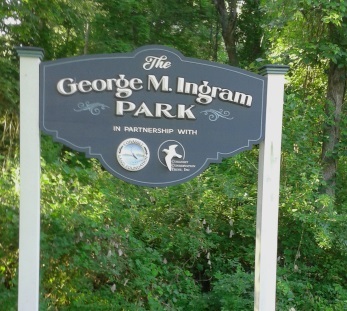 The park is named in honor of Osborn's father, George. The 27.4 acres with additional acreage from the Vendanta Center, a spiritual meditation center, comprise the almost 50 acres of the park. 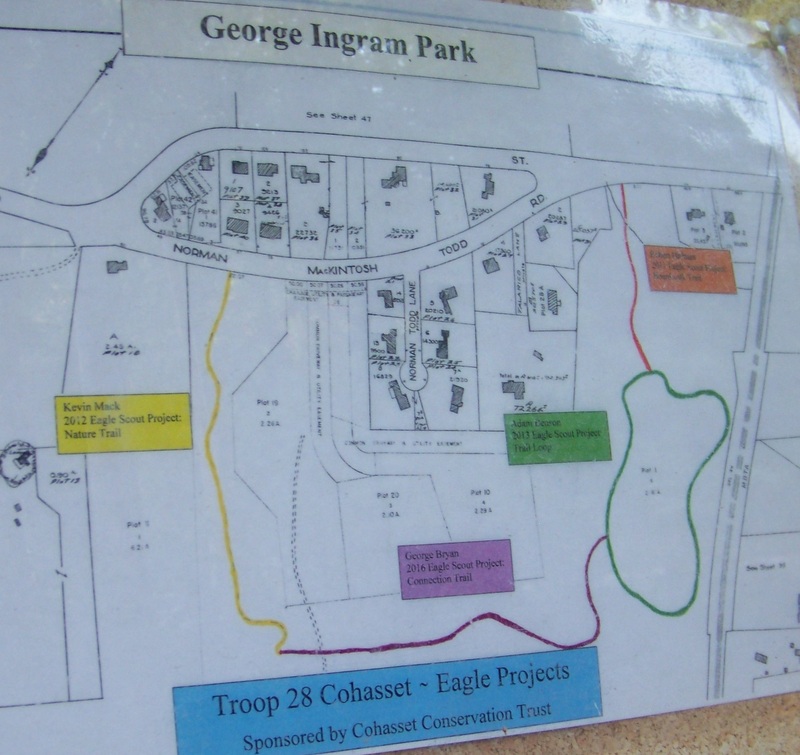 Continuing a look at the map, you will notice the trails are a result of a series of Eagle Scout projects. The first in 2011 by Robert Hillman with his work highlighted by the color orange, the Hillman Trail with the first set of boardwalks. 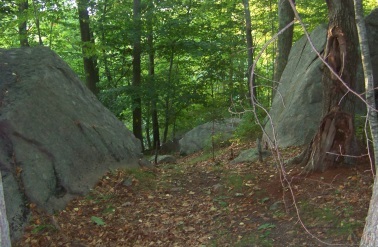 Then in 2012, Kevin Mack completed his trail leading to the observation area a top the boulder. His project is highlighted in yellow. Next in 2013, Adam Benson completed the Benson Trail Loop connecting to the Hillman Trail highlighted in green. Recently in 2016, the two portions have been connected by the trail made by George Bryan highlighted in violet. The Cohasset Conservation Trust suggests parking along Heritage Lane. Use the cross walk across Beechwood St. to enter the George Ingram Park. A couple of stairs down will lead you in and to a kiosk with a map of the trails. 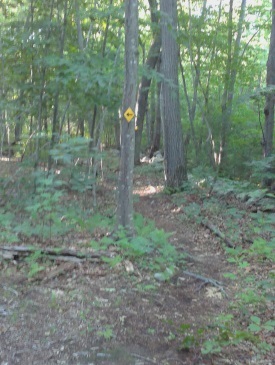 The yellow diamond blaze is used often to help mark the trail through the park. The hiking trail starts off as a narrow and grassy path. Shortly in the first boardwalk is passed over. Afterward the trail becomes mossy and large tree roots must be navigated. There are small orange flags presently on the trail. 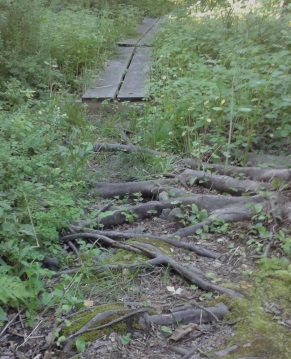 Future boardwalk over rough terrain perhaps? 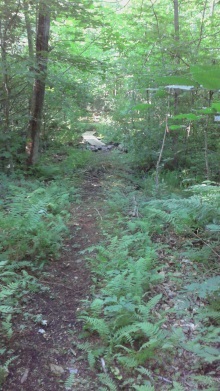 There are a few rough areas like this one but most of the trails are smooth. Soon there is a 2nd more extensive set of boardwalks to cross. After these the trail curves to the right and becomes more earthen. The forest is dark here but the sun filters in. There will be more roots and rocks to contend with and a gentle incline. These yellow diamond blazes are used extensively in the park and are a welcome feature, making the way through the conservation area easy. an area I like to call the boulder garden. to the left the stone wall forms a boundary. once it climbs to it's height will become a bit winding. The way will become more narrow, curves to the right and passes between two boulders. The stone wall leads away downhill. 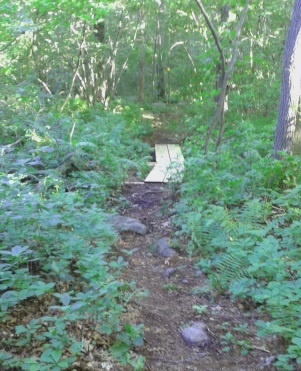 This portion of the hiking trail will lead alongside the MBTA commuter train tracks. 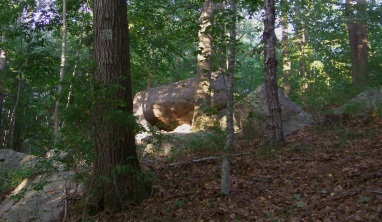 The trail passes between these two boulders. The trail will descend and then climbs. To the right with more boulder garden. The hiking trail then runs along a shallow hill side, turns right and ascends again. A marker points to the right and looking to the way of the boulders there is the framework of a shelter leaning on one side of the boulders. 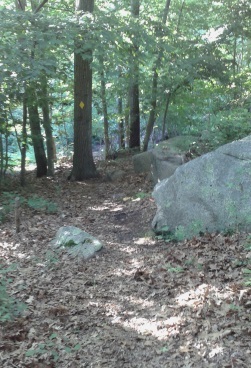 The boulder garden has some faint trails running around the boulders. Great place for young children to climb! 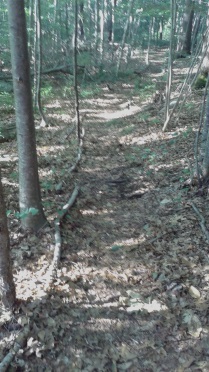 The trail turns left and becomes lined once again by forest material. Soon the lining stops and the trail becomes narrow, but runs level. and the trail will run between two young trees. Then at 1/3 miles there will be a cellar hole to the left. An old foundation to a small building or shed that once stood here. Now young trees grow through the hole. The hiking trail passes to the right of the hole and continues straight and level til it reaches an arrow pointing right. The trail now becomes rocky and soon reaches the intersection with the new trail connecting the two portions of the park. If you only want a quick jaunt through the area, continue straight and another arrow will once again point to the right. This is mostly a gentle curve rather than a direct turn. Surely in the fall these arrows are well needed! There will be another set of planks to cross. These look like they have been added very recently! The hiking trail then curves again to the right and passes through another stone wall this one looking like someone dismantled the wall to allow the trail to pass through. The arrow guides you straight through a stone wall and back on the boardwalk trail out to the trail head. There will be another arrow this time directing you to the left and another boulder will appear on the right. 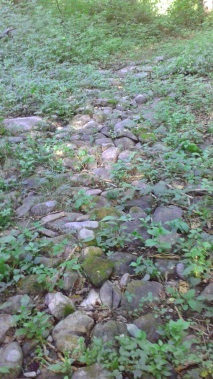 The trail now becomes well defined but earthen once more. Soon after, you will come upon the original first intersection. Now the arrow points straight and you will follow out the same way you came in. 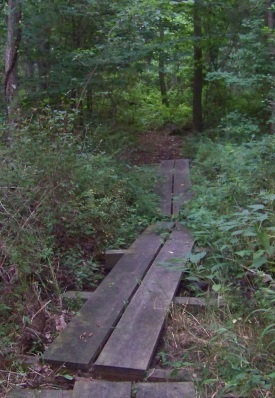 This loop hiking trail (the Hillman Boardwalk Trail and Benson Loop Trail) measure in at 1/2 mile. Great for small children especially those who like to climb rocks but not necessarily want to hike long distances. If you want a bit longer hike and bigger loop, AND to see all that the George Ingram Park has to offer, take the left on the connector trail shortly after the Cellar Hole. If you have followed to the left at the original intersection, the connector trail will lead to the left shortly after passing the cellar hole about .40 miles. If you have gone right as the arrows now direct, (new trail work) it will only be about .15 miles into the journey. 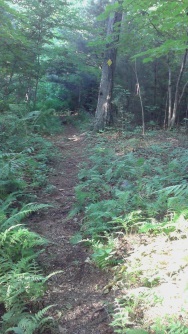 The connector trail will start off narrow and lined by ferns. It becomes a bit rough mostly due to it's being a newly made trail. long ago and at other times cuts its own way. 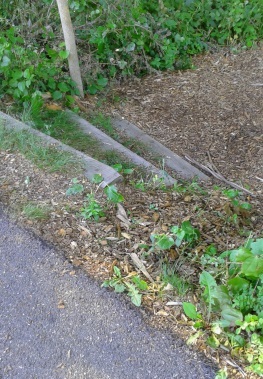 There will be some large roots to travel over then some newly made boardwalk planks. 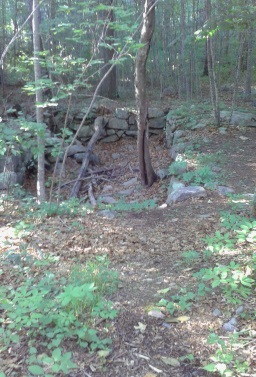 The hiking trail will soon after, pass through a typical colonial stone wall, though this one looks like it has received some rebuilding. The trail continues rough, but widens and appears to partially follow one of those older ways through the forest. The trail then passes through another stone wall. The trail turns right to continue as the older road turns left and fades. The trail will now narrow, but the brush is cut wide at its sides and then runs along a stone wall at its right. 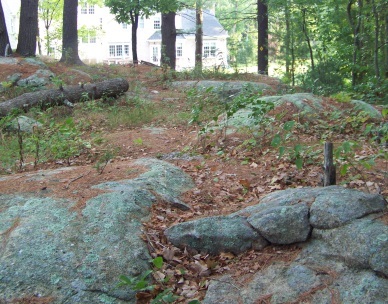 There are a series of stone walls that intersect through the area. Boundary lines from long ago or separate grazing grounds for different farmland animals? but is too organized to be so. Maybe traction for a wet area in earlier times? Or a primitive culvert of sorts. 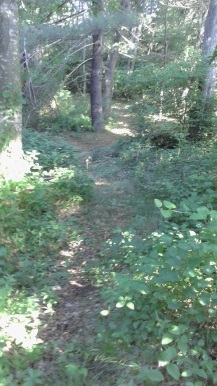 At .55 the trail climbs a short moderate ascent and a private property now comes into view to the left. More small orange flags on the trail. Markers or work related? They seem to assist in marking the way along the hiking trail! The trail comes to an interesting area where several beech trees make a bit of a canopy over the trail. Our way becomes narrow but more defined. At .67 the trail becomes rocky and lined by briar bush. Soon there is an abundant patch of poison Ivy to contend with. 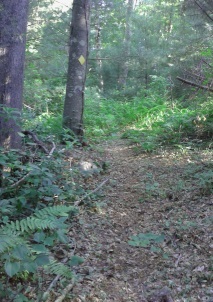 There will be a small trail leading to the left, mostly likely leading to the private residence. 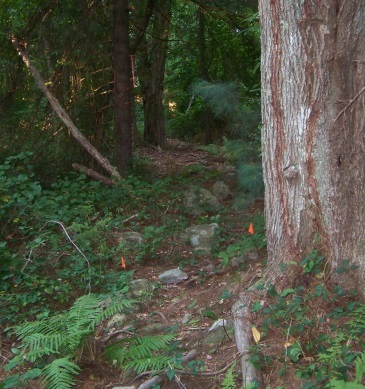 Trail becomes a bit obscure, but the small orange flags help mark the way as the trail continues straight. The trail becomes very narrow but meets a rock wall and becomes defined again. First sight of the bench at the observation area from the Connector Trail. The trail will descend now but ever so slightly almost unnoticeable. It continues shortly in a pleasant winding nature and then passes through a bit of a cedar grove. One of the trail blazes appear and then the trail starts the climb to the observation area. 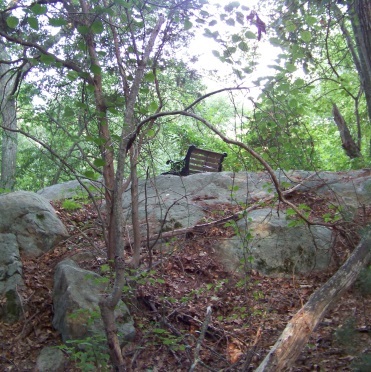 It climbs a narrow path up a large boulder/rock outcropping where a bench has been placed. 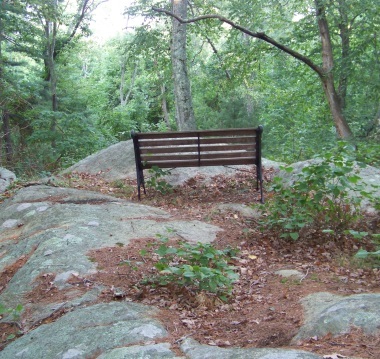 The bench gives a good view of the forest below. over the rest of the outcropping. Soon another blaze will appear as you head toward the back yard of a private residence. This portion of the journey is on the Mack Trail. 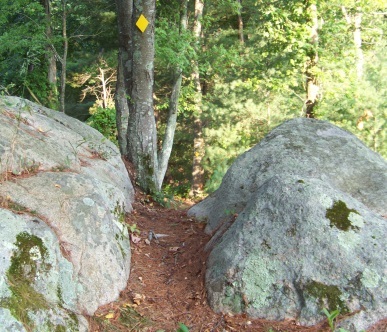 the trail leads through two boulders and downhill. It leads down into the forest on a narrow track. At .90 miles it comes to a large pine tree, there will be more orange flags and then the trail will become more defined once again. Soon after it will pass over a rock wall, not a clearing as like previous wall passing's. There will be a blaze with an arrow to assist with trail direction. The trail will continue narrow but defined and interesting. Soon the sound of passing vehicles on Norman Todd Rd can be heard alerting you to the trail's approaching end. Before doing so the trail will lead through a fern garden, then the last stretch of trail winds through the forest and passes a very large double pine that once was a triple pine. One last blaze and over a now dry stream bed. 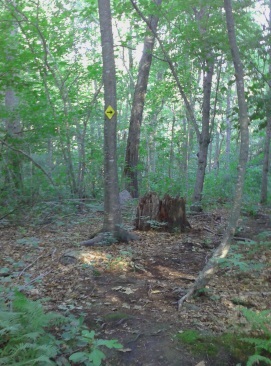 The trail out to the street is a bit overgrown, but there is a newer sign announcing that part of the park. The trail lets out to the street at 1.03 miles across from house #35. You can complete a circuit by turning right and following the street back. There is no sidewalk for .13 miles. If not comfortable you can retrace your steps and turn left at the start of the connector trail which may add more mileage if that is a desire. Using the street as part of the hiking trail the journey tops out at 1 1/4 miles. Along the way there is a small picturesque pond at the intersection with Beechwood St. 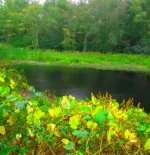 Unfortunately this summer drought ate the pond. It now looks like a sunken vacant lot. Hope we get rain and the pond returns! most directions on this site start from Route 3 as the start point. From that route take exit 14 and follow route 228 into Hingham. Following through most of Hingham on this route til the intersection with route 3A. Take a right heading south on route 3A. Follow past Stop and Shop and approx. another 1/2 mile till the lighted intersect with Beechwood St. Go left here. Beechwood will make a fork with Norman Todd Road. Either street will take you to the same point as they both connect again. Some rocky or high tree root areas. couple of stream crossings though in summer of 2016 they are dry!